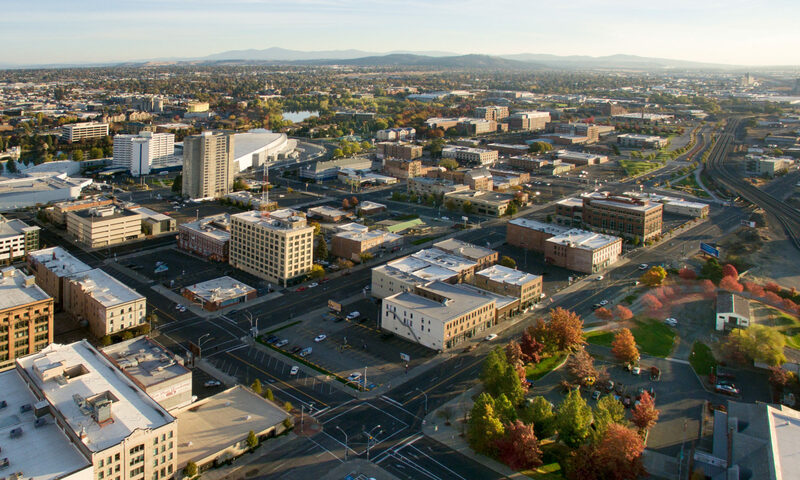 In the early 1970s, in the lead-up to Expo 74, civic leaders in Spokane decided to make a major change to downtown. In addition to relocating the railyards off of what became Riverfront Park, business groups and planners demolished broad swaths of heritage buildings on West Trent, then Spokane’s “skid row.” To distance the area from its seedy past, the street running through it was renamed “Spokane Falls Boulevard.” The short-term vision was to provide an ample amount of parking for the swarms of regional and international visitors who would soon descend on downtown, with future opportunities on the sites to be determined. Naturally, these plans never materialized. Spokane’s venerable skywalk system has served the city and the region for almost fifty years, allowing pedestrians the ability to cross between buildings without braving the elements. At one point, the system was the second-largest in the United States. Today, it features around sixteen of the above-street passageways. But while the system once received significant use (one 1984 study found 43,200 crossings in a single July day) and allowed small businesses to thrive in the second floor of downtown buildings, the skywalks today sit with minimal use. Moreover, the skywalks harm downtown vitality, because they pluck pedestrians from the street, where they would improve the sidewalk environment. There are two major issues with this. First, more eyes on the street tends to lead to less crime and certainly less perception of crime. If you talk to some people, crime is the number one issue they refuse to go downtown. Second, because access to the skywalk system is controlled largely by the owners of the buildings that they connect, the skywalks at a certain level may separate well-heeled professionals and shoppers from the urban poor, the homeless, and the lower class. This creates a perception of vagrancy on the street level, and of course, it’s a huge ethical and social justice concern. The magic of the sidewalk is that it encourages social mixing, creating a public sphere which allows for interaction, communication, and learning. But here’s the thing: we’re still expanding the skywalk system, despite the fact that it’s outlived its usefulness. Walt Worthy and the Public Facilities District in 2014 constructed a new skywalk to link the Davenport Grand and the Convention Center. And now, Cowles Company, the owner of the Spokesman-Review, KHQ, and River Park Square, intends to replace two sets of skywalks in the Macy’s Building, which it recently purchased. The second-floor skywalks to River Park Square and to the Parkade Building will be removed and replaced on the third-floor. It’s great that Cowles Company intends to expand the downtown Spokane commercial district to the east, but we need to have a conversation about the skywalks. Especially in this case, they irreparably damage the beauty of a historic structure with many decades of history in Spokane. They harm downtown vitality. And especially in the case of the Parkade skywalks, which are not air conditioned or heated, offer no additional utility to pedestrians. It’s time for them to be removed. So let’s have a conversation. Let’s issue a one-year moratorium on skywalk construction. During that time, we’ll have a long-term discussion about the future of the system. Will they be gradually removed over time? Will some of the skywalks, such as the skywalk from River Park Square to the Macy’s Building, or from River Park Square to the Crescent Court, be retained? Is there anything we can do to enliven the skywalks, or alternatively, encourage people to explore the street level? We hope to see this conversation, but it’s only going to happen with swift action. Contact your City Councilmembers and ask them to consider a temporary skywalk construction moratorium. SHARE YOUR THOUGHTS: Do you think we need to have a long-term discussion about the future of Spokane’s skywalk system? Do you use the skywalks? Do you think there’s a way to retain the skywalks but also improve downtown vitality on the sidewalks? And what do you think about the ethical and social justice implications? Share your thoughts on Facebook, on Twitter, in the comments below, or in person. We love to hear from you! UPDATE: Convention Center Hotel creates…a dead urban street? Okay, so there are windows, I suppose. But other than that, newly-released renderings reveal that Walt Worthy’s Convention Center Hotel won’t do much to improve the pedestrian experience on East Main. While in the past, pedestrians walking on the north side of Main were forced for walk past several surface parking lots, now they will have to endure four floors of above-ground parking with minimal facade improvements and interaction with the built environment. Had the parking for Convention Center Hotel been built underground or in a better configuration, this could have been an incredible opportunity to revitalize two streets instead of one, especially with re-development at the former Huppin’s Building and at the Bennett Block, both of which are in the midst of major remodels. Imagine streetfront retail or restaurants on this side of the building. The result would have been a more continuous string of restaurants and smart downtown retail all the way to Main Market and beyond. That would have provided an economic boost and a cultural boost. This in contrast with the Spokane Falls Boulevard-side of the building, which looks comparatively excellent for pedestrian interaction and space (see a photo after the break). Instead, we are left with a mostly uninviting urban environment reminiscent of the currently-empty downtown EWU Center. What do you think? Share your thoughts in the comments, on Twitter, on Facebook, and all over the web. We love to hear from you. nystrom + olson architecture is designing this remodel of the Bennett Block between West Main and West Spokane Falls Boulevard. Construction should be underway shortly, as demolition of the old Cyrus O’Leary’s restaurant is now complete. We love these new designs—they’re exactly what is necessary for this area to do well. Frankly, the renderings look somewhat similar to the Cannery in San Francisco. The eventual and likely next step to infilling West Main? A mid-rise to high-rise brick building next door on the site of a current Diamond Parking lot and the reconstruction of the Howard-Spokane Falls and Stevens Spokane Falls intersections. Get on it, Ron Wells.